Why IPTV is the Future of Television? If you are not familiar with IPTV, it is the method of delivering content over the internet as opposed to via an antenna, radio signals, cables or satellite lines. The term IPTV first appeared in 1995, but it hasn’t been widely used. As the use of high speed Internet increases, IPTV is widely deployed in subscriber-based telecommunications networks with high-speed access channels into end-user premises via set-top boxes or other customer-premises equipment. IPTV is also used for media delivery around corporate and private networks. Are You Ready for Internet Protocol Television ? 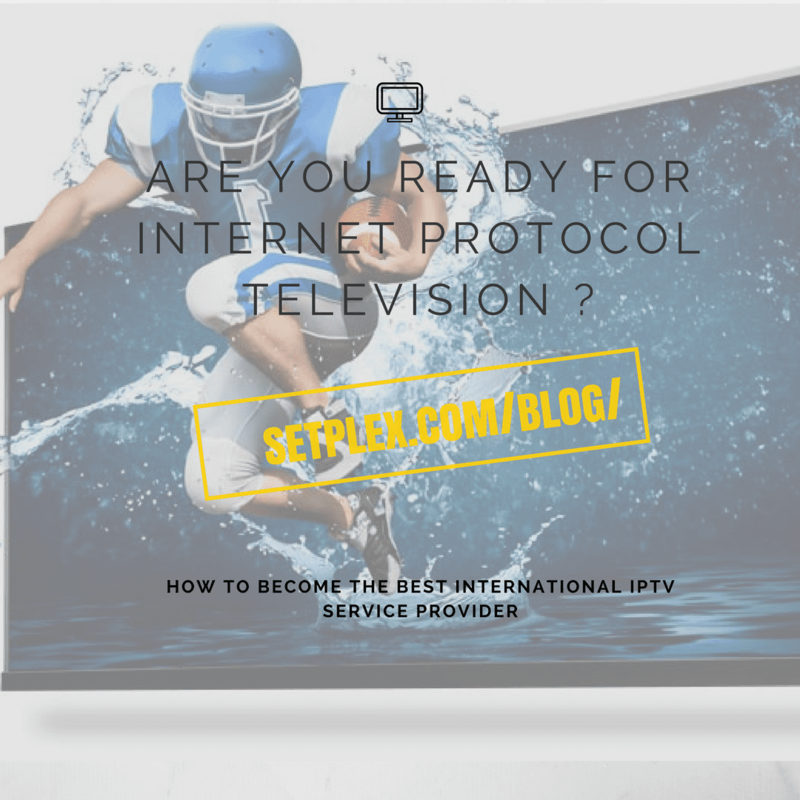 Hello, and welcome to part two of our blog series on the rise of Internet Protocol Television and why, when it is all said and done, this rise is going to benefit everyone. If you haven’t read our last blog post on this topic, we suggest you do that before starting this one. Why Choose IPTV or What Benefits Does IPTV Offer ? However, if you are one of those people who doesn’t mind jumping in halfway through a story then, by all means, continue reading. Here at Setplex, we already know that IPTV is a major disrupting force in the world of media distribution. Cable and satellite companies, the long established leaders in the media distribution game, are starting to feel the effects of IPTV and, unfortunately for them, the effects are not advantageous to them. In today’s society, people want efficiency. Computers have changed society and part of that change has to do with gratification. People are tired of hearing “this is the way we’ve always done it” and are now starting to embrace the idea of technology delivering more effective means to achieve things. In today’s post, we are going to continue to go over how this societal shift in attitude has been a major driving force in the rise of IPTV. For far too long, we, as a society, have been subjected to the unfavorable business practices of major cable and satellite providers. Even the most basic of cable packages is pricey and, for the most part, people tend to only watch a few channels out of the package. While cable and satellite companies will boast that they offer X number of channels, how many of those channels are actually interesting to the people paying for the package? Luckily, IPTV puts control back into the hands of the consumer. IPTV has, for the first time in a long time, allowed the consumer to choose exactly what they want to watch, how they want to watch, and when they want to watch it. Below, we have listed a few more reasons that IPTV is becoming the preferred method for media consumption. One of the biggest factors that is driving consumers away from traditional media content providers is price. For many people, the price that traditional media content providers demand is not reflective of the service that they receive. For example, many people are highly unsatisfied with basic level cable packages. These “budget” packages still run at around $89 a month, however, they include the bare minimum of channels. This includes a handful of local and national stations but, rather glaringly, many of these channels are not channels that people are actually interested in watching. Of course, people can upgrade their cable packages; unfortunately, this is not the easiest thing to do. Cable and satellite companies do not let people pick the channels they want. They offer packages and upgrades that include bundles of channels. So, if a channel that you really want is only offered in the $150 bundle, that is what you will have to pay, regardless of whether or not you care about any of the other channels included in the packages. If this sounds crazy to you, don’t worry, you are not alone. Perhaps the most impactful, yet unexpected, impact on the IPTV market came in the form of mobile internet access. For decades, portable televisions have been available. These tiny screens normally relied upon TV broadcast signals to receive a picture and were, for the most part, offered low performance and poor quality. With the birth of the smartphone, people suddenly had a way to watch high-quality videos on the go. The only thing that was missing from the equation was a content provider that could meet this market. Luckily, IPTV was seemingly built for this exact purpose. Through IPTV, consumers were suddenly able to watch their favorite shows on the go and, for the first time, millions of people started to realize that perhaps traditional media content delivery methods were not the end-all solution to consumers’ needs. The final driving force that we are going to analyze is one of the newest; however, it is poised to be one of the most important. In the beginning, IPTV filled consumer demand by delivering their favorite shows in a more convenient and cost-effective format. Services like Netflix and Hulu gained wide popularity for these services but rather quickly realized they were missing an amazing opportunity. Why only repackage existing content when they could provide users with original content as well? As both companies grew, their resources grew as well, resulting in the ability to produce high-quality shows branded as their own original content. Not only was this content well received by their subscribers, it is becoming an increasingly important part of both companies’ business models. We hope that this short series has helped paint a better picture of exactly why IPTV is becoming as popular as it is. While it may seem that the rise of IPTV has been sudden, when you study the media industry, the seeds for this transition of power were planted long ago. The popularity of Internet Protocol Television can be directly traced to an increase in iptv internet speed (as well as a decrease in internet price), dissatisfaction with the cable and satellite industries, and new forms of technology that allowed people to consume media on the go. If you would like to learn more about IPTV or how to broadcast over the internet and how to become the best international iptv service provider, please visit the Setplex website today. We truly believe that once you experience our products, you will see why IPTV is the best choice for consumer media consumption. Wow! Really amazing article “IPTV is the future”. Thanks For Sharing Very Useful. Great explanation on your website. Thanks for sharing the post. How to Install NoraGo on Computer ? How to Install NoraGO on Apple (Smartphone) ? How to Install NoraGO on Android (Smartphone) ? Michellelehner on Why Choose IPTV? Get in touch and let us know how we can help. You can contact us through email and phone. This website and its content is copyright of Setplex LLC 2018. All rights reserved. You may not, except with our express written permission, distribute or commercially exploit the content. Nor may you transmit it or store it in any other website or other form of electronic retrieval system.